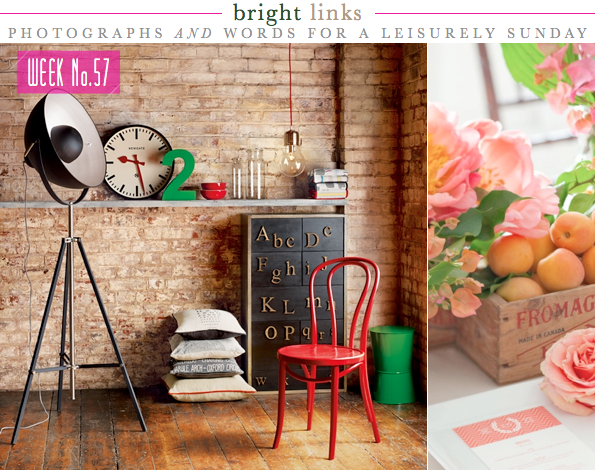 So honoured that Elle magazine picked one of Bright.Bazaar's posts in their weekly round up. Would love to try this cheese box DIY. Seeing Suki's place with Little Fine Day's Gran wallpaper made me love the design even more! How fun is this 'Places on Earth' map? Loving Famille Summerbelle's new wallpapers - thanks for heads up, Kristen. In my latest column for Houzz I rounded up the best picks from the market for autumn tabletops. How brilliant are these chocolate letter placecards? Igor has launched his new blog, Happy Interior Blog - check it out! A weekend of colour facades, autumnal trees, baking focaccia bread, recipe holders and much more! Three colour palettes inspired by Dulux's key colour, Twilight Cinders. John Lewis' two key contemporary trends for A/W 2011. Manvi kicked off her Tablescape 101 series with a dark and dramatic, full on monochromatic tabletop for Halloween. Inspiration for creating an artistic and industrial home office. A fun and colourful entryway DIY idea. @Jamie - I love owls as well! @Hilla - Will head on over to check it out now! Congrats on the mention, Will! Love the beautiful space you picked, by the way!